I’m sure I’m not the only parent of a first-born who keeps a mental list of things I would do differently with my (so far still theoretical) future babies. Near the top of the list is committing more fully to letting those gross motor skills – things like sitting, crawling, and walking – occur naturally and in their own time. This is actually an idea I heard of relatively early in Tom’s life, when he was about two months old. 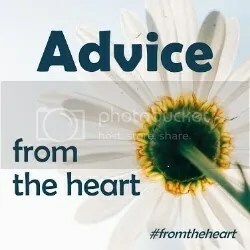 I discovered a brilliant parenting website by a lady named Janet Lansbury, who is a proponent of the ‘RIE‘ (Resources for Infant Educarers) style of early years care. This approach to raising children follows the principles laid out by Hungarian early years expert, Magda Gerber. At the heart of the RIE approach is respect for the baby/child; all other principles stem from there. One of the core principles of the RIE approach is that babies should be allowed to move freely and develop their gross motor skills naturally. This means no tummy time, no propping babies to sit, no using walkers, jumperoos or ‘walking’ babies along, and, wherever possible, encouraging babies/toddlers to climb down from high places by themselves, rather than lifting them down. The argument is that babies who are allowed to navigate these milestones by themselves are more in touch with their bodies and more in tune with their physical motions, making them more graceful and less likely to fall. As a result, it’s actually a safer approach than placing them in situations they can’t get out of themselves. And it is more respectful, as it allows the baby the freedom to move naturally, rather than being dependent on an adult to place them in a particular way. There’s a whole host of articles on Janet’s website, so I recommend starting here with the main principles of RIE, if you are interested in learning more. I say I would commit more fully to this with future babies. That’s because my adherence to this principle with Tom has been a bit patchy. Before I found out about RIE, Tom spent most of his time either in my arms (feeding) or propped up in a bouncy chair. Once I had read some of the articles, I started laying Tom down on his back on a blanket or fleece on the floor instead. I’d surround him with toys, and was quickly surprised by how much he was able to move, simply by pushing with his feet and creeping (very slowly) about the floor. 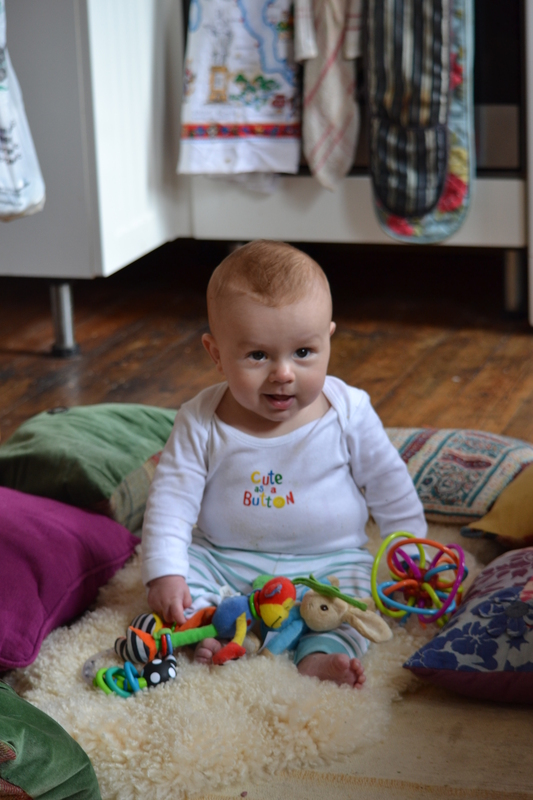 Later, once he learnt to roll, he could scoot about on his tummy fairly easily. I have to confess, once Tom was about five months, we did occasionally sit him up on the floor surrounded by cushions. It was a fairly rare occurrence, but it did happen. This was at least partly because I hadn’t adequately explained the reasoning behind not doing this to Mr Techno – for some reason I thought he wouldn’t support it, which was daft because he did place Tom on his back to play most of the time, even without me explaining why I had started doing that. 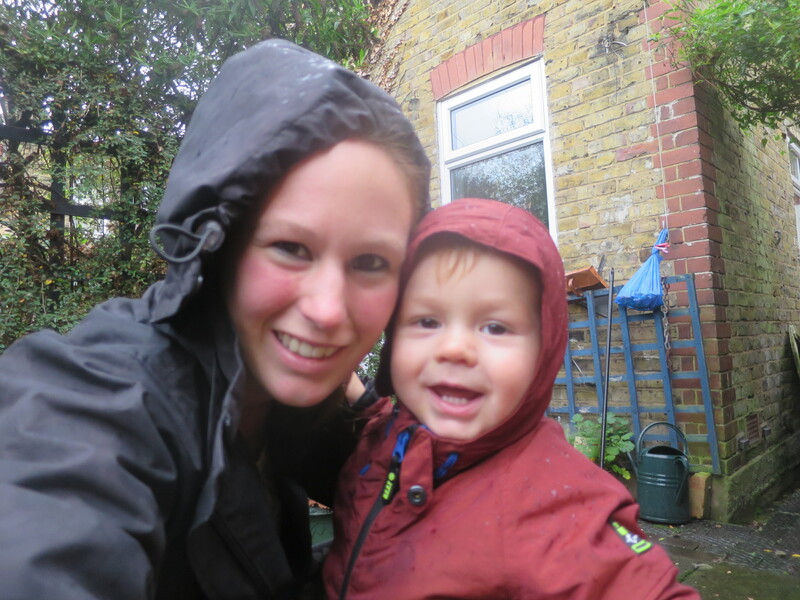 I also justified it because I knew we would take the ‘baby-led weaning’ approach to weaning Tom, which requires babies to be able to sit up before they start solids. I now realise I could have only sat Tom up in a high chair for meals, rather than on the floor for playtime. 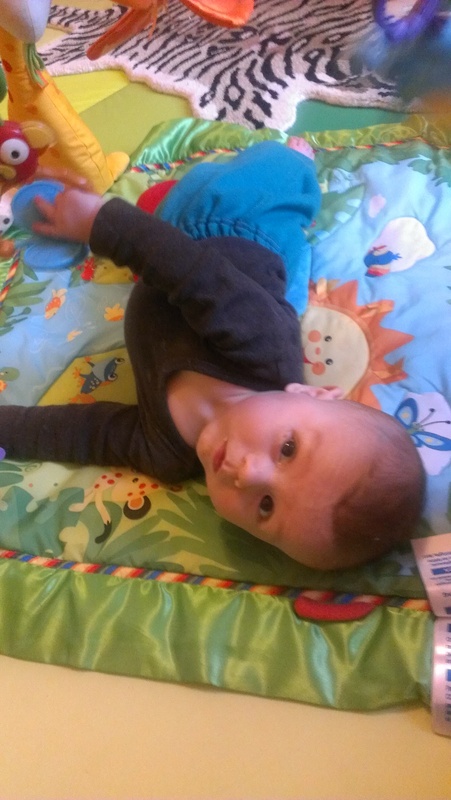 By 7.5 months, Tom was crawling (arms first, then legs too) and it was logical to carry on letting him play freely on the floor, without restraining him in any way. It was noticeable that, contrary to my mum’s predictions, Tom could get into a crawling position from his tummy. He didn’t need to be sitting up first. In fact, it wasn’t until he was 10 months that he could get into a sitting position by himself and even now he gets onto all fours first, rather than sitting up from a lying down position. For him, that is just the natural way of doing it. Tom has been in a walker precisely once in his life (at my in-laws, when I wasn’t around). He has pushed his buggy around in the park a bit, or our office chair around the flat, but, in both situations, worked out he could do so himself rather than us encouraging him too. Another confession; we did sometimes (though rarely) let him hold our hands and walk along before he could walk by himself. Usually though he just cruised along the furniture. I’m definitely not saying that any of this has made Tom reach milestones any sooner. It hasn’t. 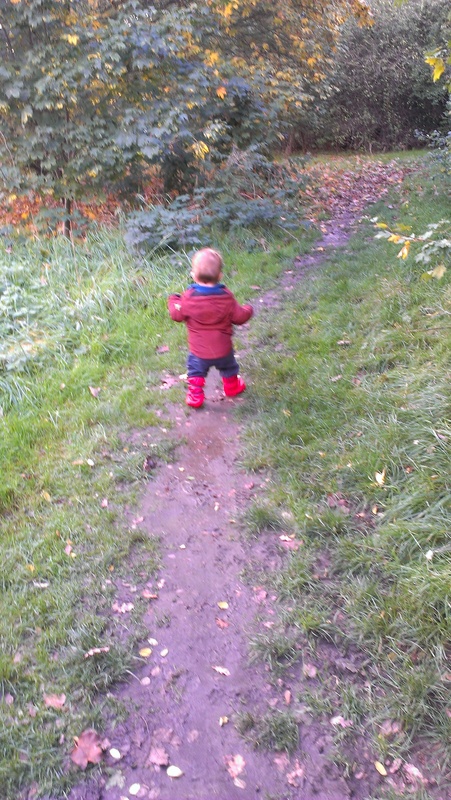 He was an average age crawler and a very slightly late walker. But he has done both these things with great confidence. 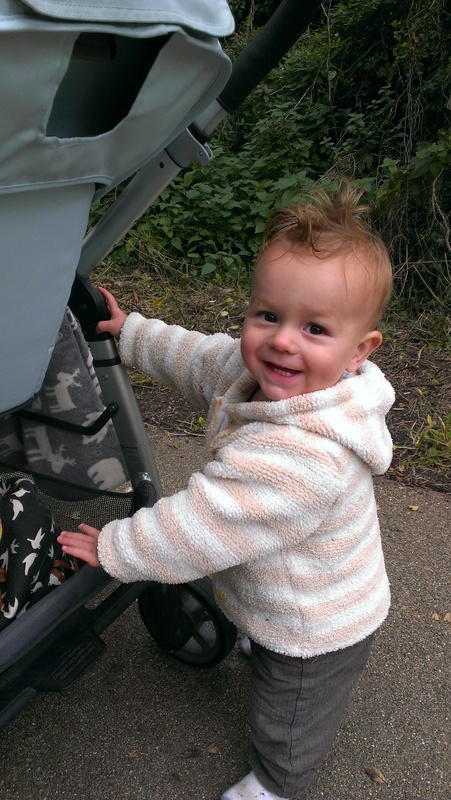 He’s only been walking about two weeks, but already his nursery key person has commented on his control – apparently toddlers usually struggle to regulate their speed at first. As soon as he could walk, he could stop and stand still, change direction, and bend to pick something up off the floor. He does take the odd tumble, but far less than I expected. He also meets challenges well. In the park the other day, I watched a two-year-old girl reach a slope and hold out her hand immediately for her grandmother’s hand to be helped to walk down it. Tom reached the same slope, got down on all fours, turned round and went down it backwards, without a single comment or helping hand from me. Because that’s how we taught him to go down stairs. Sorry, terrible photo. He was in motion! Tom has proved to me that this way of letting babies develop is better, safer and more respectful. So if we ever have another child, I’ll be making sure Mr Techno and I are on the same page from day one and let motor control develop naturally. 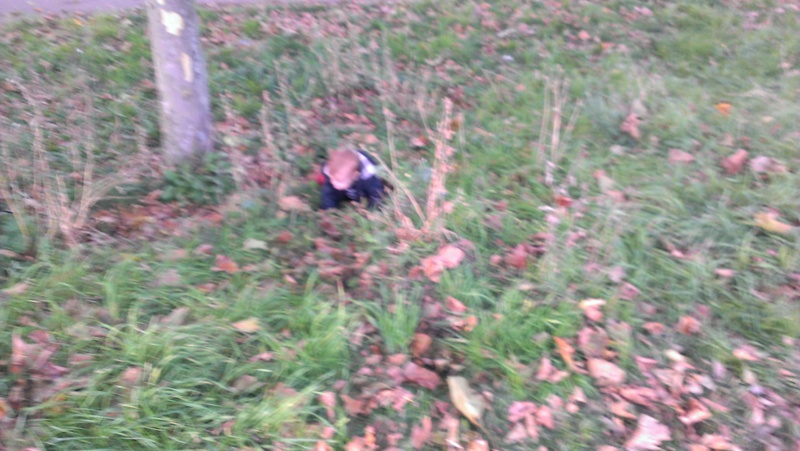 Posted on October 28, 2015 December 18, 2015 by LucyPosted in Food for Thought, ParentingTagged crawling, free play, gross motor skills, learning to walk, natural development, RIE, tummy time.